You are stumped. You see, you have been noticing that a lot of your projects require a lot of creative input. Your presentations are decent but secretly you envy the flashy stuff that your competitors and suppliers are dishing out. You get by on your social media accounts with stock photos but you know you could do so much more. Let’s face it. You need your own creative team. But should you be hiring them as full time employees? A better option would be to look to outsourcing for your creative needs. Here are the top ten reasons why outsourcing would be a better option for you. Let us be realistic. Unless you are a creative agency yourself, you would not need a full time creative on call the whole time. More often than not, once the creative project is done, you would have a creative employee sitting around doing nothing. Hiring people will not only require you to pay them a salary but also require you to pay other costs like government benefits, not to mention providing equipment and the additional overhead cost of onboarding a new employee. Outsourcing your creative needs means that you only have to pay the for the contract fees which are usually lower than paying for a full time employee. When hiring a new employee, you have to also invest a certain amount in training and development. This is a double0edged sword because the more you invest in a certain employee, the more hireable he or she becomes. This can lead to your competitor hiring him or away from you unless you also pay upgrade his or her salary. You would not worry about this in an outsourced creative agency. Creative agencies usually are staffed with much more experienced personnel. You will get the benefit of industry experts rather than being stuck with just one person with a limited worldview. A creative agency would already have all the equipment and know-how to hit the ground running. The moment that a contract starts, agencies do not need much lead time to get going. A hire would have to get used to your equipment, equipment that you would have to supply yourself. That adjustment period can mean valuable lost hours for you. Outsourcing your creative needs also means that you have a more or less set up team that already has its system in place. This means that there already operational efficiencies that you can take advantage of rather than creating those efficiencies when you hire your own creative. Note that this is probably not your core business and knowing where these efficiencies can be found are harder for you. Outsourcing also gives the company the opportunity to get fresh new ideas from outside the company culture. This allows for healthy change that can be utilized by the company. Since agencies are often neck deep in the industry, you can get updated with industry standards and new trends rather than relying on just one person. When you hire an employee, you also have to provide him or her with management guidance. You would have to monitor all his or her key result areas and you actually have to manage him or her as an employee. This valuable time can be spent better on the key operations of the business rather than a part of the business that could have been outsourced. Sometimes it just does not work out. Firing an employee is a painful process and you have to pay a lot of disengagement costs like back pay and severance pay. On the other hand, if you are dissatisfied with the performance of an outsourced agency, you can disengage easier than having a full time employee on board. 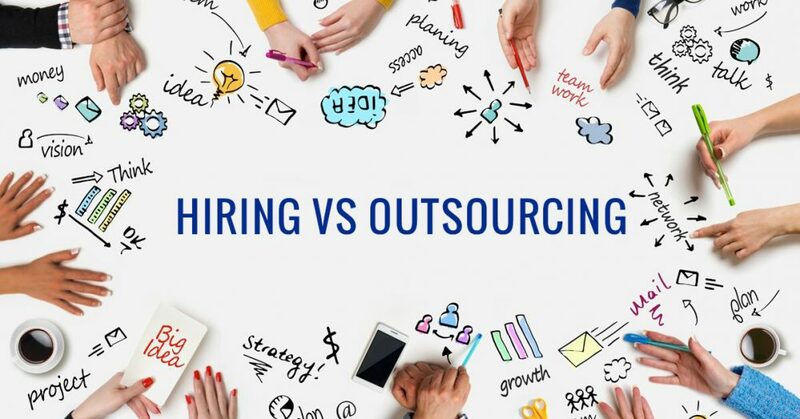 All these reasons make outsourcing a much more viable proposition than hiring your own. This leads to fruitful partnerships than will help your organization grow that much faster. Professional Blogging Summit 2015 An invitation-only event is said to attract bloggers, social media specialists, marketing gurus, and entrepreneurs nationwide. 15 Marketing Quotes to Fuel your Business Strategy Let these quotes inspire you to change the way you think about marketing. 10 Ways to Achieve Blogging Success Thinking of starting your own blog? Here are top 10 tips to help you become a successful blogger. Business Website Essentials Must haves for any business planning on having a website of their own.